Multiple choice questions on figures of speech, comprehension, grammar, syntax, etc. The Language Studies Shelf A Cicero Workbook Jane W. Crawford 7 Judith A. Hays Bolchazy-Carducci Publishers 1000 Brown Street, Unit 101, Wauconda, IL 60084 0865166439, $22.00 www.bolchazy.com l-847-526-4344 Bolchazy-Carducci Publishers is the premier publisher of books and curriculum materials for Latin language and literature studies. 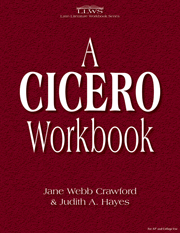 A Cicero Workbook is the collaborative effort of Jane W. Crawford (Professor of Classics at the University of Virginia) and Judith A. Hays (who was named Illinois Latin Teacher of the year in 1997), that is specifically and successfully designed to facilitate a student's reading skills and comprehension levels with regard to Latin passages from Cicero's 'Pro Archia' and 'De Amicita'. Among its features is the complete Latin text of all the selections on the Cicero Advanced Placement syllabus; preparatory questions following each Latin passage that help the student unravel Ciceronian grammar and syntax; multiple choice questions on comprehension, grammar, syntax, figures of speech, etc. ; short analysis questions that require interpretation of Latin passages and probe a student's understanding of Cicero's logic and persuasive skills; practice essay questions, AP type questions on translation; and a comprehensive Latin to English vocabulary specifically designed for these Cicero texts. Also very highly recommended for high school and college Latin curriculums from Bolchazy-Carducci Publishers are Cicero: De Amicitia Selections (9780865166394, $17.00); Cicero: Pro Archia Poeta Oratio: 2nd Edition (9780865166424, $20.00); Vergil ForBeginners: A Dual Approach To Early Vergil Studies (9780865166288, $21.00) and Vergil's Aeneid 8 & 11: Italy And Rome (9780865165809, $17.00). Five outstanding new titles from Bolchazy-Carducci Publishers in the area of Latin instruction are superbly presented, 'user friendly', and highly recommended additions to any personal studies, academic library, or school curriculum reference collection. Separate Teacher Guides for these five student instructional texts and manuals are also available and recommended for classroom instructors. Reinforce Cicero's grammar, syntax, rhetorical devices and much more in this workbook.